1. Preheat the oven to 200˚C/R6. Heat the olive oil in a frying pan and sauté the onion until soft and golden. Add the garlic and spices and cook for another minute so that the spices release their fragrance. Allow to cool. Put the lamb in a bowl and add the onion and spice mixture then season well. Use your hands to mix everything together. Cover and put in the fridge while you roll out the pastry. Divide the pastry in two and, on a lightly floured surface, roll each piece into a rectangle about 40cm x 12cm. 3. Mix the chutney with the chilli sauce and spread half of it down the centre of each piece of pastry, leaving about a 2.5cm clear edge all the way round. Lay the long sausage shapes on each piece of pastry, aligning it along the long side, 1.5cm in from the edge. Now roll each long sausage up in the pastry and seal the edges with a little water (use your finger or a brush to apply it). Put the join in the pastry underneath. 4. Using a small knife cut each long pastry-wrapped sausage into 8-10 sausage rolls (you can make them larger if you prefer). 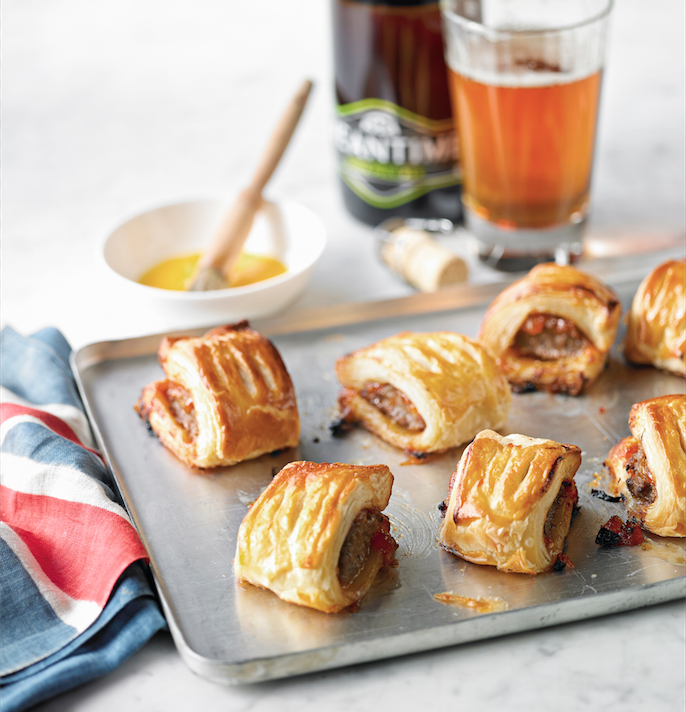 Place them on to a non-stick baking sheet and make a couple of little slits in the pastry of each sausage roll. Brush the rolls all over with the beaten egg (try to keep it on the sausage rolls and not the baking sheet). Cook in the preheated oven for 15 minutes, or until golden.